The design of scrapers (tractor scrapers) allows for loading, hauling, dumping, and spreading of loose materials. Use a scraper for medium-haul earthmoving operations and for moving ripped materials and shot rock. The haul distance (zone of operation), the load volume, and the type and grade of surface traveled on are the primary factors in determining whether to use a scraper on a particular job. The optimum haul distance for small- and medium-size scrapers is 3,000 feet or less. Bowl. The bowl is the loading and carrying component. It has a cutting edge, which extends across the front bottom edge. Lower the bowl until the cutting edge enters the ground for loading, raise it for carrying, and lower it to the desired lift thickness for dumping and spreading. Apron. The apron is the front wall of the bowl. It is independent of the bowl and, when raised, it provides an opening for loading and spreading. Lower the apron during hauling to prevent spillage. Ejector. The ejector is the rear wall of the bowl. Keep the ejector in the rear position when loading and hauling materials. Activate the ejector to move forward during spreading to provide positive discharge of materials. Struck capacity means the bowl has a full load of material that is level with its sides. Heaped capacity means the material is heaped in the bowl and slopes down on a 1:1 repose slope to the sides of the bowl. In practice, these will be LCY of material because of how a scraper loads. Therefore, load volume in terms of BCY moved depends on both the bowl size and the material type being loaded. The rated volumetric capacity of the Army 621B scraper is 14-cubic-yards struck and 20-cubic-yards heaped. The capacity of the CAT® 613B scraper is 11-cubic-yards heaped. Elevating scrapers, like the Army 613, are not given struck capacity ratings. The optimum haul distance for the small- and medium-size scrapers is 300 to 3,000 feet. There are larger scrapers that are effective up to 5,000 feet. A scraper is a compromise between a machine designed exclusively for either loading or hauling. For medium-distance movement of material, a scraper is better than a dozer because of its travel-speed advantage and it is better than a truck because of its fast load time, typically less than a minute. Another advantage of the scraper is that it can spread its own load and quickly complete the dump cycle. 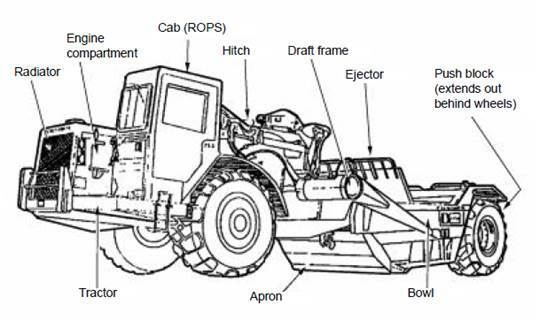 The production cycle for a scraper consists of six operations—loading, haul travel, dumping and spreading, turning at the dump site, return travel, and turning and positioning to load. 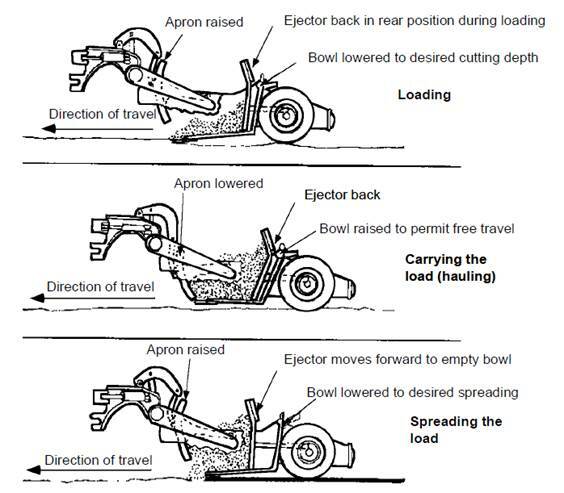 Figure 3-2 shows the functions of the apron, bowl, and ejector during loading, hauling, and dumping. The CAT® 621 loads with push-tractor assistance. This scraper can load to a limited extent without assistance, but requires push loading to achieve maximum production. Pusher assistance is necessary to reduce loading time and wheel spinning. Reducing scraper wheel spinning increases tire life. The scraper should not depend on the pusher to do all the work. Conversely, do not spin the scraper's wheels to pull away from the pusher. Use pusher assistance for either straight, downhill, or straddle loading. Always load the scraper in the direction of haul. Do not turn the scraper at the same time it is accelerating from the loading operation. The CAT® 613 is a self-loading machine, and pushing during loading will damage the scraper’s loading elevator. Downhill loading enables a scraper to obtain larger loads in less time. Each 1 percent of favorable grade is equivalent to increasing the loading force by 20 pounds per ton of gross scraper weight. Straddle loading (Figure 3-3) requires three cuts with a scraper. The first two cuts should be parallel, leaving a ridge between the two cuts. The scraper straddles this ridge of earth to make the final cut. The ridge should be no wider than the distance between a scraper's wheels. With straddle loading, time is gained on every third trip because the center strip loads with less resistance than a full cut. Back-Track. Use the back-track push-loading technique (Figure 3-4) where it is impractical to load in both directions. However, this method is inefficient due to the time spent in backing up and repositioning for the next load. Chain. Use the chain push-loading technique (Figure 3-4) where the cut is fairly long, making it possible to pick up two or more scraper loads without backtracking. The pusher pushes one scraper, then moves behind another scraper that is moving in the same direction in an adjacent lane. Shuttle. Use the shuttle push-loading technique (Figure 3-4) for short cuts where it is possible to load in both directions. The pusher pushes one scraper, then turns and pushes a second scraper in the opposite direction. Step 1. Use the service brake to reduce scraper travel speed when close to the cut (loading lane), and downshift to first gear for loading. Step 2. Move the ejector to the rear. Step 3. Open the apron partway. Step 4. Lower the bowl to an efficient cut depth after the scraper enters the cut. Continue moving forward until the dozer contacts the scraper and begins pushing. 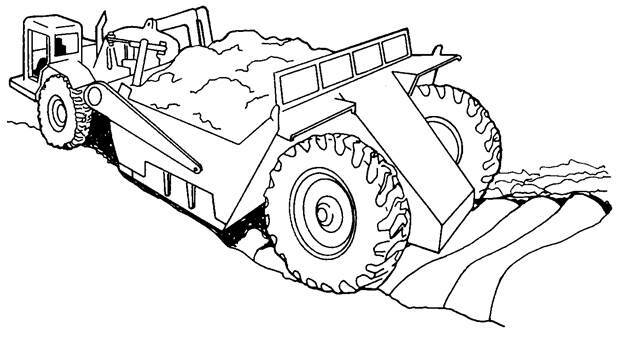 If the scraper tires spin before the dozer makes contact, stop and allow the dozer to assist. When the dozer makes contact, push down both the differential lock and the transmission hold pedal and proceed in second gear. The cut should be as deep as possible, but it should allow the scraper to move forward at a constant speed without lugging the engine. Decrease the cut depth if the scraper or pusher lugs or if the drive wheels slip. Use the router bits on the vertical side of the bowl to gauge the depth of cut. Once an efficient depth of cut is determined, use that same depth on successive passes. • Regulate the apron opening to prevent material from piling up in front of the lip or falling out of the bowl. • Keep the machine moving in a straight line while maintaining pusher and scraper alignment. • Do not overload the scraper. Overloading lowers efficiency and places unnecessary stresses on the machine. • Raise and lower the bowl rapidly when loading loose material such as sand. NOTE: When a push tractor is used, it should be waiting about 45° off of the lane to be cut. This allows the loading unit to come in with the least delay and difficulty. Step 6. Raise the bowl slowly when full, while at the same time closing the apron to prevent spillage. Step 7. Allow the pusher to help the machine out of the cut area, if necessary. NOTE: When exiting the cut, release the transmission hold and/or the differential lock, if in use. Accelerate to travel speed as quickly as possible. Travel a few feet before lifting the bowl to the carrying position. This spreads any loose material piled up in front of the bowl and allows the following scraper to maintain speed. Loam and Clay. . Loam and most clay soils cut easily and rapidly with minimum effort. However, loosen very hard clay with a dozer ripper before loading. Step 1. Enter the loading area fast, lowering the bowl slowly, and pick up as much material as possible using the momentum of the scraper unit. This will fill the hard-to-reach rear area of the bowl. Step 2. Shift to a lower gear once the momentum is lost, and allow the pusher to assist. Step 3. Pump the bowl up and down (Figure 3-5). For best pumping results,drop the bowl as the scraper’s rear wheels roll into the depression of the previously pumped area and raise the bowl as the wheels are climbing out of the depression. Step 4. Drop the bowl sharply two or three times at the end of the loading area to top out the load. Then close the apron, raise the bowl, and exit the cut area. Rock and Shale. Loading rock and shale with a scraper is a difficult task that causes severe wear and tear on the equipment. Ripping will ease this problem. Ripping depth should exceed the depth of the scraper cut. When loading the scraper, leave a loose layer of ripped material under the tires to provide better traction and to reduce both track and tire wear. Some soft rock and shale can be loaded without ripping. Start the scraper’s cutting edge in dirt (if possible) when loading stratified rock. Move in to catch the blade in planes of lamination. This forces material into the bowl. Pick up loose rock or shale on the level or on a slight upgrade, with the blade following the lamination planes. Loading time is critical for obtaining maximum scraper production. Push loading should normally take less than one minute within a distance of 100 feet (time and distance change with the material being loaded). 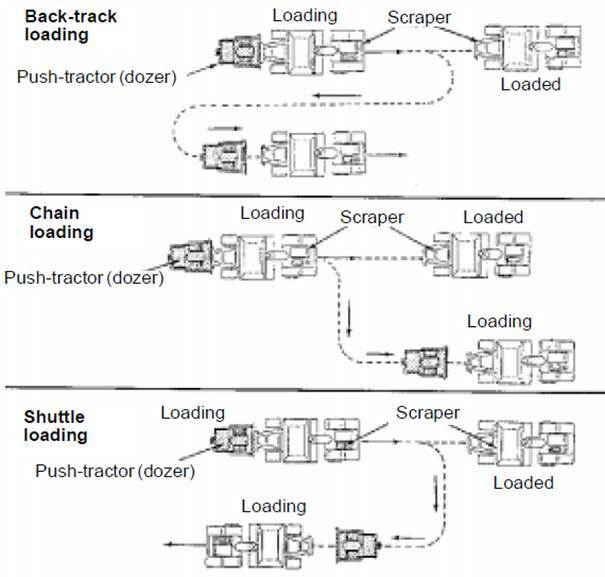 Studies of load volume versus loading time indicate that for a normal operation, about 85 percent of scraper load capacity is achieved in the first 0.5 minute of loading. Another 0.5 minute will only produce about another 12 percent increase in load volume. Therefore, extra loading time (past about one minute) is not worth the effect because increased total cycle time will decrease production. It is essential to have highly competent personnel in the borrow-pit area. Traffic control within the borrow-pit area reduces waiting time and excess travel of earthmoving support units. Maintaining adequate drainage throughout the borrow pit will reduce downtime caused by bad weather. Hauling, or travel time, includes the haul time and the return time. Here the power and traction characteristics of the scraper become very important. The following factors can greatly effect travel time. Lay out the haul routes to eliminate unnecessary maneuvering. Plan the job to avoid adverse grades that could drastically reduce production. Remember, where grades permit, the shortest distance between two points is always a straight line. Keep haul roads in good condition. A well-maintained haul road permits traveling at higher speeds, increases safety, and reduces operator fatigue and equipment wear. • Dust. 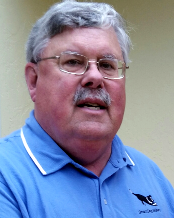 Use water distributors to reduce dust. Reducing the amount of dust helps alleviate additional mechanical wear, provides better visibility, and lessens the chance of accidents. Keeping roads moist (but not wet) allows them to pack into hard, smooth surfaces permitting higher travel speeds. Once on the haul road, the scraper should travel in the highest safe gear appropriate for road conditions. When possible, carry the scraper bowl fairly close to the ground (about 18 inches). This lowers the center of gravity of the scraper and reduces the chance of overturning. • Lugging. Avoid unnecessary lugging of the engine. Downshift when losing momentum. Lugging the engine usually results in a slower speed than the top range of the next lower gear. Although the machine can make it, it is best to downshift and accelerate faster. Lugging causes a decrease in engine revolutions per minute (rpm) thereby reducing hydraulic pressure. This will result in a loss of steering control. • Coasting. Never coast on a downgrade. When approaching a downgrade, slow down and downshift the transmission. To prevent unwanted upshifting, use the transmission hold on a downgrade if it is available. Also, use it when approaching an upgrade or in rough underfooting. To control speed on a downgrade, use the retarder and service brakes. 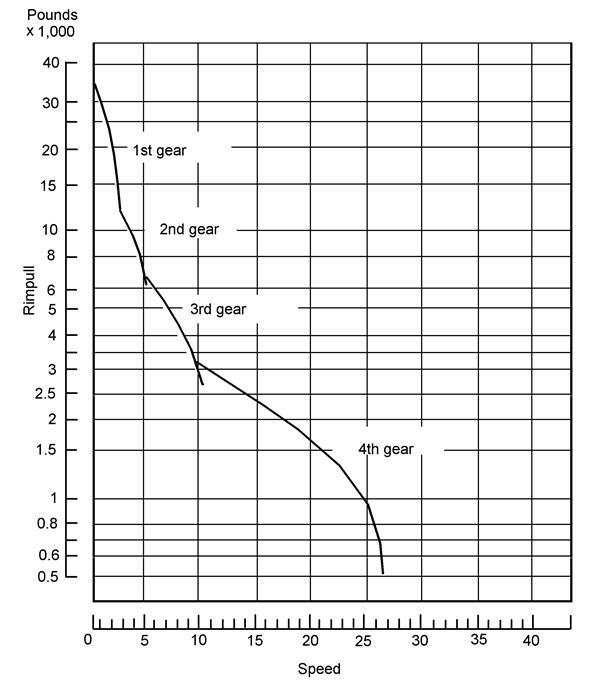 Engine speed should not exceed the manufacturer’s recommended rpm. When dumping, lower the bowl to the desired lift height and open the apron at the beginning of the dump area. Dump and spread in the highest gear permitted by haul-road conditions and fill-material characteristics. Constant speed, along with bowl height, will help to maintain a uniform depth of lift. Slowly dribbling the load at low speed slows down the cycle. Step 1. Move steadily across the spreading area. Step 2. Open the apron fully as the scraper reaches the location to begin dumping. Move the ejector forward to push the material out of the bowl. Step 3. Maintain a straight path through the spread area. Step 4. Close the apron when all the material is out of the bowl, and return the ejector to the rear of the bowl. Step 5. Raise the bowl slowly to clear obstacles (12 to 18 inches) during the return trip to the loading area. Step 1. Dump and spread the first load at the front of the fill. Step 2. Travel with subsequent loads over the previous fill, provided the lifts are shallow. Step 3. Start each following dump at the end of the previous fill. Step 4. Finish dumping and spreading one full lane before starting a new one so that rollers can start compaction. Step 5. Repeat this method in the next lane. Do not waste time on the fill. The scraper should return to the cut area as fast as possible after dumping the load. 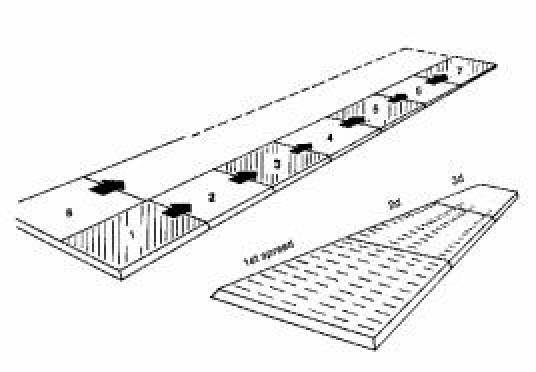 Plan the egress from the fill area to avoid soft ground or detours around trees or other obstacles. To maintain the desired fill slope, make the fill high on the outside edges. This will prevent the scraper from sliding over the slope and damaging the slope. If there is rain, build up the low center for drainage, or use a grader to cut the outside edge down, creating a crown in the middle of the area. Different materials require different dumping and spreading procedures. Sand. Spread sand as thin as possible to allow better compaction and to make traveling over the fill easier. • Do not try to spread the material too thin. • Keep the bowl high enough to allow the material to pass under the scraper. Material not having enough room to pass under the scraper will roll up inside the bowl into a solid mass that is difficult to eject. • Bring the ejector forward about 12 inches at a time. • Back the ejector about 6 inches after each forward movement. This breaks the suction between the material and the bowl. • Repeat this procedure until the bowl is empty. Following is an explanation of production estimating based on a step-bystep method using the CAT® 621B scraper. When developing data for production estimates, consider all factors that influence production. Consider the scraper’s weight, the weight of the load, and the average grade and rolling resistance of both the haul and return routes in arriving at a cycle time. The same steps are applicable to other makes and models of scrapers, using the appropriate tables and charts for those scrapers. Step 1. Determine the vehicle weight, empty and loaded. • Empty vehicle weight (EVW), in tons. Using Table 3-1, first determine the EVW from the EVW column based on the specific make and model of the scraper. • Weight of load, in tons. Determine the weight of the load in pounds by determining the scraper load volume in cubic yards (this is in LCY of the material) and the material unit weight (in pounds per LCY). If no specific material-weight data is available, use the information in Table 1-2, as an estimate. Multiply the scraper load volume by the unit weight in pounds per LCY of the material to be excavated. Then, convert the resulting weight into tons by dividing the amount by 2,000. • Loaded or gross vehicle weight (GVW). Determine the GVW by adding the EVW (tons) and the weight of load (tons). Determine the GVW of a CAT® 621B single-powered scraper with a 20 LCY load of dry loam. From Table 1-2, dry loam is 1,900 to 2,200 pounds per LCY. Use an average value of 2,050 pounds per LCY. Step 2. Determine the average grade (in percent) and the distance (in feet) for both the haul and return routes. Uphill grades are positive (+) and downhill grades are negative (-). Obtain this information from a mass diagram or a haul route profile. The project mass diagram indicates that there is a 5 percent downhill grade from cut to fill and that the one-way distance is 800 feet. The same route will be used for both the haul and the return. Determine the rolling resistance (haul and return) for a CAT® 621B scraper carrying a 20.5-ton load if the tire penetration during the haul is 3 inches and the tire penetration on the return is 1 inch. NOTE: Enter the percent grade as a percent not as a decimal. Determine the grade resistance and grade assistance for a CAT® 621B scraper carrying a 20.5-ton load on a -5 percent grade from cut to fill. Available rimpull is the amount of force that can actually be developed as limited by traction. The engine may be able to develop the rimpull, but the rimpull must be able to be transferred at the point where the tire touches the ground. Therefore, required rimpull must always be less than available rimpull, or there will be tire slippage and the work will not be accomplished. Step 6. Determine the travel speed. • The travel speed of a piece of equipment is the maximum speed at which the vehicle can develop the rimpull required to overcome the opposing forces of grade and rolling resistance. The manufacturer normally provides this information in tables or charts. Figures 3-8 and 3-9 show rimpull charts for the CAT® 621B and the CAT® 613B. • To determine the travel speed, locate the rimpull required for either the haul or return on the left side of the chart. Read to the right until intersecting the line representing the highest gear which can achieve that amount of rimpull. Read down from the gear intersect to determine the maximum travel speed. NOTE: Determine the travel speed for both the haul and the return. Determine the maximum travel speed for a CAT® 621B scraper, based on the following data. First, determine the travel speed for the haul. Refer to Figure 3-8 and locate 1,614 pounds on the scale. This is below the lowest scale number of 2,000 pounds so use the bottom line on the rimpull scale. 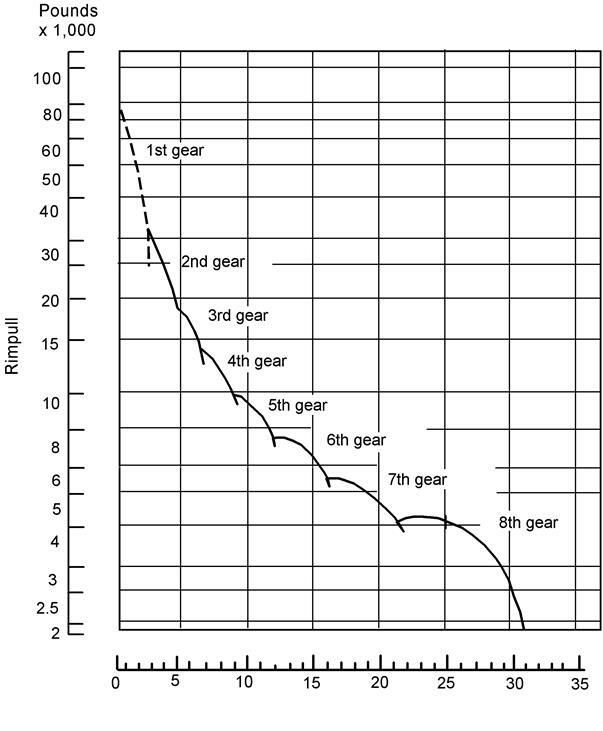 Read right to determine travel gear (eighth gear) and down to determine travel speed (31 miles per hour [mph]). Second, determine the travel speed for the return. Refer to Figure 3-8 and locate 5,661 pounds (interpolate between 5,000 and 6,000 on the rimpull scale). Read right to determine travel gear (seventh gear) and down to determine travel speed (17 mph). NOTE: If computed travel speed (either haul or return) exceeds expected operating speeds for your operation (due to known weather conditions, operator skill, etc.) use your maximum expected speed. Step 7. Determine the total travel time. Total travel time is the sum of the time it takes the vehicle to complete one haul and one return. • First, determine the haul travel time. • Second, determine the return travel time (in minutes). NOTE: The haul and return routes are not always the same. Be sure to use the correct haul distance for each computation. Determine the total travel time for a CAT® 621B based on a haul speed of 31 mph, a return speed of 17 mph, and a haul distance of 800 feet. The unit’s SOP limits scraper travel speed to 25 mph. Determine the haul and the return travel time. Determine the total travel time. Step 8. Determine the cycle time. • The cycle time is the sum of the total travel time and the time required for loading, dumping, turning at the dump site, and turning and positioning to load, plus the time to accelerate/decelerate during the haul and return. • The average dump time for scrapers having a heaped capacity of less than 25 cubic yards is 0.3 minute. The type or size of the scraper does not significantly affect the turning time. Average turning time in the cut is 0.3 minute and 0.21 minute on the fill. The cut turning time is slightly higher because of congestion in the area and the necessity of spotting for loading. Therefore, for both the CAT® 613 and the CAT® 621 scrapers, allow 0.81 minute for dumping, turning at the dump site, and turning at the load site. The question of the time for loading is the consequential variable. • A good average time for loading the CAT® 621 with a D8 or equivalentsize push tractor is 0.85 minute. Modify the time for loading or the assumed load volume if using a smaller push tractor. With a D7, expect load times approaching 1 minute. The self-loading CAT® 613 requires 0.9 minute to load in good material. Good means loam, loose clay, or sandy material. Encountering tight materials will increase the loading duration. To determine the turn-and-dump time and the load time for a special piece of equipment, time the equipment as it goes through a few cycles. Determine the cycle time for a CAT® 621B scraper with a D7 push tractor based on a travel time of 0.9 minute and an average turn and dump and load time. Step 9. Determine the trips per hour. To determine the number of trips per hour, divide the working minutes per hour by the cycle time. Normally there are about 50 minutes per hour of productive time on a well-managed scraper job. However, if the cut is in a tight area such as a ditch or if the embankment is a narrow bridge header, the estimator should consider lowering the productive time to a 45-minute working hour. Determine how many trips per hour a CAT® 621B can make based on a 50-minute working hour and a cycle time of 2.71 minutes per trip. Step 10. Determine the hourly production rate. To determine the hourly production rate, the average size of the load (in LCY) and the number of trips per hour must be known. The capacity of the scraper, the material type, and the method of loading will determine the average size of load. NOTE: To convert from LCY to either BCY or CCY, multiply the production rate by a soil conversion factor from Table 1-1. Determine the hourly production rate in BCY per hour for a CAT® 621B working in loam, making 18.5 trips per hour, with an average load of 20 LCY. Step 11. Determine the total time in hours required to complete the mission. To determine the total time required to complete a mission, the total volume to move, the hourly production rate, and the number of scrapers to be used on the job must be known. Determine how many hours it would take to move 19,440 BCY, using three CAT® 621B scrapers, each with an hourly production rate of 296 BCY per hour. If it is necessary to complete the job in a specified time, use the same basic formula to determine the required number of scrapers. Step 12. Determine the number of push tractors required. The number of push tractors required is a ratio of the scraper cycle time to the push-tractor cycle time. The self-loading CAT® 613 does not use a push tractor, so this part of the analysis is not necessary when using self-loading scrapers. • Load time (discussed in step 8). A CAT® 621B loading with a D7 push tractor requires about 1 minute to load. This is the time the push tractor is in contact with the scraper. • Push-tractor cycle time. Once a scraper load time has beendetermined, use the following formula to determine the push-tractor cycle time. At this point, the number of scrapers that a single push tractor will support can be determined. Determine how many CAT® 621B scrapers a single push tractor can support if the scraper cycle time is 2.71 minutes and the scraper load time is 1 minute. As was done in step 10, convert the production into BCY or CCY by using the Table 1-1, soil conversion factors. Determine what the production will be in BCY if a single push tractor, with a cycle time of 1.65 minutes supports two CAT® 621B scrapers hauling 20 LCY of loam. Assume a 50-minute working hour. The scrapers have a cycle time of 2.71 minutes. Therefore, if using only one push tractor, the pusher cycle time will control production. NOTE: If the incorrect assumption was made that one pusher could handle two scrapers, the production would have been calculated at 590 BCY per hour. Once the number of scrapers that one push tractor can support has been determined, use the following formula to determine how many push tractors are needed to support the job if using additional scrapers. Determine how many push tractors are required on a job that has nine 621B scrapers if a single push tractor can support 1.64 scrapers. Round UP!